We provide consultancy, treework (tree surgery), woodland management and landscaping services to commercial customers throughout Greater Manchester and the North West. Our fully accredited, trained and experienced team – led by our Arboricultural Manager Paul Hodgson – delivers efficient, high standard and ethical services, and provides impartial advice. Paul is also our Principal Consultant, providing services such as tree safety surveys, tree surveys for planning applications ( BS 5837:2012 ), grant advice and application. 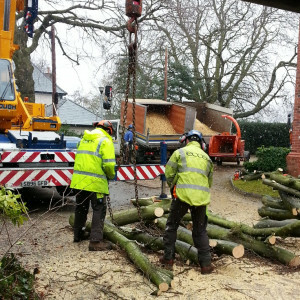 We have a wide range of capabilities and in-house equipment, allowing us to work to your specifications and budget, whilst preserving tree health and ensuring general safety. Our safety standards are accredited by both safecontractor and CHAS. All our work is carried to BS 3998:2010, we keep up-to-date with current techniques and changes in legislation, and we are fully insured, with £5 million Public Liability cover. Find out more in the ‘Why use us?’ section. Ecos delivered an amazingly prompt and professional service. Ward & Wagster Tree Services will definitely be using them again. Ecos allowed us to concentrate on the finer details of our customers requirements. Without a doubt we would recommend using them.